The film opens with a scene straight out of the source novel as a competitive Bond engages in a playful “race” against a beautiful young woman speeding toward the beach in her convertible. From the iconic theme song to Lazenby’s clenched lips holding a cigarette as his lighter illuminates a fashionable black tie kit, the moment is classic 007 and it sets the scene for a powerful film that remains faithful to Ian Fleming’s original vision for this significant story and its place in the Bond canon while also establishing the action-oriented direction of George Lazenby’s character. You can learn much about George Lazenby’s midnight blue dinner suit from Matt Spaiser’s comprehensive post at The Suits of James Bond, the definitive source for the clothing of 007’s world. I strongly urge all readers to visit The Suits of James Bond! The only time that James Bond had previously worn a dinner jacket with peak lapels was Sean Connery’s ivory dinner jacket in Goldfinger. Lazenby’s peak lapels are of a timeless, moderate width rather than excessively slim as was fashionable earlier in the ’60s or too wide as the following decade’s trends would dictate. The lapels have a straight gorge and are faced in midnight satin silk with a buttonhole through the left lapel. The opulent settings of the Hotel Palácio’s dining room frame Bond’s “date” with Tracy. The most formal option for a dinner jacket is no vents, but double vents like the long side vents on Lazenby’s jacket are a fashionably acceptable alternative. Both the single button on the front and the three buttons on each cuff are covered in midnight satin silk as well. The single-button jacket has jetted hip pockets and a welted breast pocket, though Lazenby wears no pocket square. The Suits of James Bond astutely calls out the closely but comfortably fitted dinner suit’s tasteful concessions to late 1960s fashion trends from the short fit of the jacket to the “lower-than-traditional” rise of his darted-front formal trousers. Like Connery before him, Lazenby wears trousers with three-button tab side adjusters and no waist covering. The trousers have straight pockets along the side seams and two jetted pockets on the back. The legs are trimmed with midnight satin stripes from the waistband down to the bottoms, which are plain-hemmed with a medium break at the top of his shoes. Fleming’s Bond would have little regard for Lazenby’s reckless behavior upon his return to his hotel room, exercising none of the ritual precautions outlined in the first chapter of Casino Royale… and nearly to his own peril! Bond wears two white dinner shirts from Frank Foster, the legendary London shirt-maker who also made shirts for Sean Connery and Roger Moore. Both shirts have a subtantial point collar and are made of cotton voile, a nice lightweight fabric for the summer resort-like setting. Bond’s first dinner shirt, worn during the beach scenes, has a narrowly ruffle-pleated front and squared double (French) cuffs worn with slim gold bar cuff links. Lazenby’s first shirt in action. What would “the other fella” have thought? At the casino, Bond wears his second and certainly flashier dinner shirt with two large ruffle strips on each side of the front placket, which buttons up with mother-of-pearl buttons. Lazenby lets the ruffles on his second shirt fly free after an evening of resting them unobtrusively beneath his dinner jacket where their true splendor could only be hinted at. This shirt also has squared double cuffs, this time secured with a set of small gold recessed circle links. Bond’s traditional butterfly-shaped bow tie echoes his lapel facings in dark midnight blue satin silk. Had Lazenby mastered his own take on the Bond smirk? You be the judge. Bond’s black leather cap-toe oxfords are appropriate as the most traditional and formal lace-up shoes to be worn with black tie. Silk socks are frequently chosen with formal and semi-formal wear, and Bond appears to be wearing black silk dress socks in the casino, but his shoeless scenes on the beach seem to show our hero sporting a thicker pair of hosiery, likely to protect Lazenby’s feet against the elements when filming. Aftermath of a failed assignation. 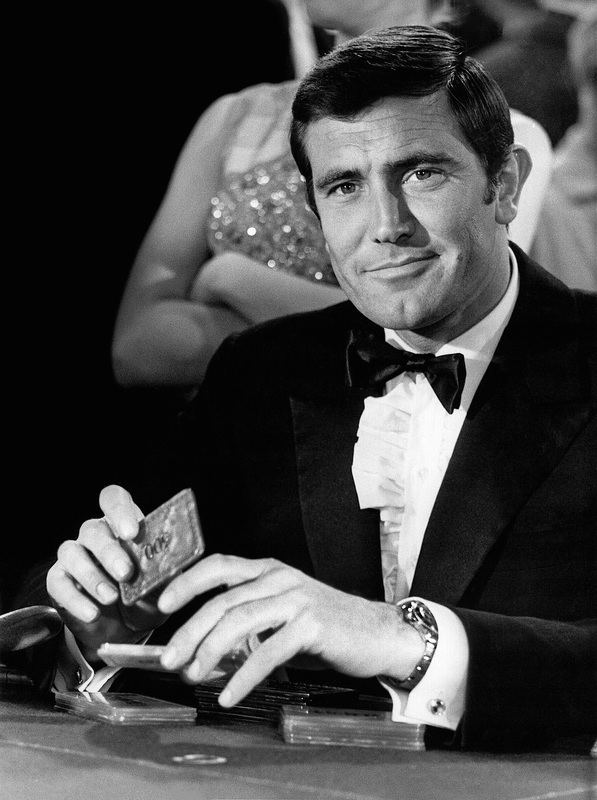 George Lazenby had reportedly tracked down a Rolex when auditioning for the role of James Bond, and the actor fittingly wears two during his sole cinematic outing as 007. Lazenby’s first on-screen Rolex is a classic ref. 5513 Submariner with a stainless steel case, black bezel and dial, and stainless Oyster bracelet. 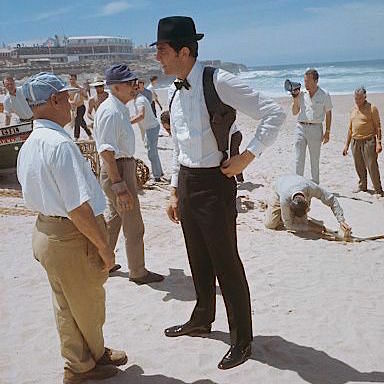 Lazenby on location in Portugal, still wearing Bond’s trilby, bow tie, and shoulder holster. Lazenby’s Bond would later wear another Rolex, a ref. 6238 pre-Daytona chronograph, when disguised as Sir Hilary Bray at Piz Gloria. After Roger Moore took over the role of James Bond, he too would wear a Submariner 5513 in his first two Bond films – Live and Let Die and The Man with the Golden Gun – before strapping on a Seiko during the quartz revolution of the late ’70s. 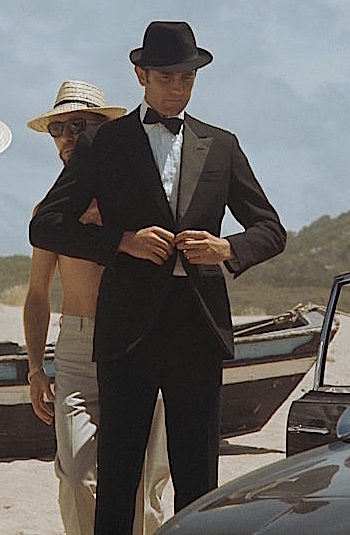 Lazenby’s Bond seems hardly the type to wear a traditional hat, though his first appearance of Bond features him motoring along the coast in a black short-brimmed trilby to top off his black tie ensemble. He soon ditches the hat (as well as his jacket) when he leaps off to rescue Tracy from the waves. The shoulder holster is another traditional accessory of Bond lore dating back to Sean Connery in Dr. No, although Lazenby wears a sleeker, updated version. Lazenby’s rig consists of a wide strap over his left shoulder connected to a thinner black strap that loops around his right shoulder. The holster itself carries his trademark Walther PPK under his left armpit for a smooth right-handed draw. Under the holster section hangs a short strap that is evidently meant to be worn fastened to Bond’s side adjuster tabs (as Sean Connery wore his), but Lazenby already has the holster unbuttoned when he easily slips it off upon returning to his hotel room. A behind-the-scenes shot from Becoming Bond of Lazenby being fitted into his shoulder holster on set. The older little man helping him seems to be the same from the beach photo above. Bond’s heavy black-framed sunglasses with their amber lenses are seen only in silhouette before they are discarded onto the passenger seat and never worn again. To me, they evoke the look of Michael Caine’s bespectacled spy Harry Palmer. Lazenby may have made some poor choices in his life, but he still was wise enough to know that James Bond wouldn’t wear sunglasses at night. Lazenby makes a brief appearance as a tuxedoed Bond later in the film during the “We Have All the Time in the World” montage of his various dates with Tracy. Photographs and footage that has surfaced of George Lazenby screen-testing with various actresses and posing for publicity photos shows him in a more traditional, minimalist ensemble of a Connery-style shawl-collar dinner jacket and plain-fronted shirt with a herringbone woven bib and covered fly placket… with nary a ruffle or pleat to be found. Lazenby during the audition process, twirling Bond’s trademark PPK. French actress (and author) Marie-France Boyer turns away from the gunplay. By the time Lazenby’s Bond had made it to the big screen, he would be appropriately ruffled, courtesy of master shirt-maker Frank Foster. On Her Majesty’s Secret Service reclaimed Ian Fleming’s “down-to-earth” James Bond after the cinematic spectacle of You Only Live Twice. Right from the opening scene, Bond is motoring along a beach-side road in his Aston Martin when reaches for his cigarette case and lighter, echoing the wide gunmetal case and Ronson lighter that got plenty of ink in Fleming’s novels, and lights up. No tricks or rockets from this cigarette… just Bond enjoying a smoke from a simple unfiltered cigarette that even has the three gold rings of the Morlands that had been commissioned by Ian Fleming in real life to denote his Commander rank in the British Royal Navy. Fleming would later pass his exact smoking habits, right down to the triple-ringed cigarettes in the same Balkan and Turkish tobacco blend, on to his most famous fictional creation. Can anyone better versed in tobacco lore than I identify the brand of cigarette Lazenby actually lights up as Bond? The blue printing at the midway point is certainly brand-suggestive. Lazenby may have been the last cinematic Bond to make use of a cigarette case, but he was only one in a long line of Bond interpretations to show an appreciation for fine champagne. In this case, it’s a bottle of Dom Pérignon of 1957 vintage that he orders to share with Tracy. A champagne aficionado would have known Bond’s champagne order to be the sign of someone trying to look more sophisticated than they were, as there was no 1957 vintage produced of Dom Pérignon; Bond should have instead ordered a 1955 or a 1959, particularly as the latter would have fit the literary Bond’s stated preference for ten-year-old champagne. 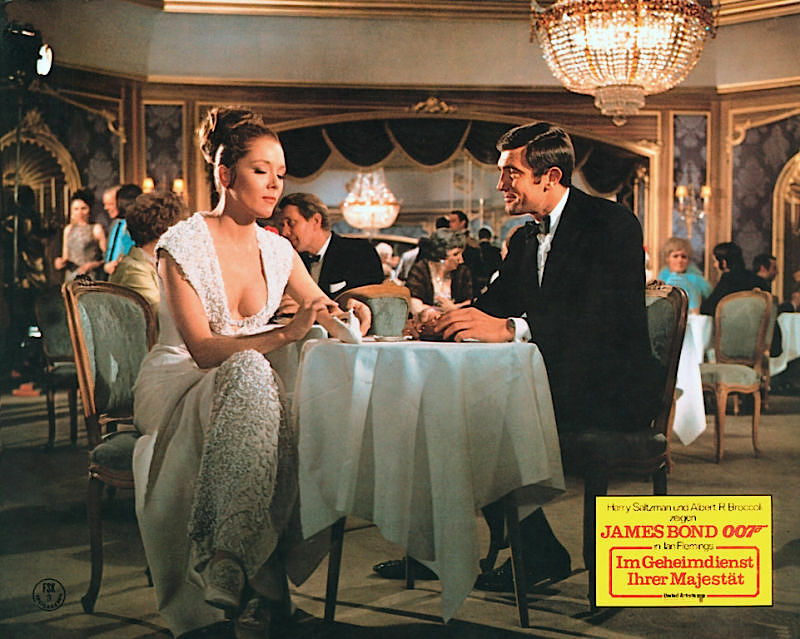 This German lobby card for Im Geheimdienst Ihrer Majestät features a full shot of Tracy and Bond in the dining room of the Hotel Palácio. Mr. Bond, no stranger to this type of suggestion, takes Tracy up on her offer. Again eschewing caution, 007 strides into her hotel room and immediately finds himself engaged in fisticuffs with Che Che (Irvin Allen), one of Marc-Ange Draco’s more robust henchmen. Bond knocks the man cold after a closely choreographed fight… then feels the need to show off even more by sampling some caviar on his way out the door and noting to no one in particular: “Royal Beluga… north of the Caspian.” He then sets off to his own room for a fateful and inevitable assignation with Tracy. As for the hotel itself? Bond himself stated earlier in the lobby that “everything seems up to the Palácio’s usual high standards,” establishing the setting as the Hotel Palácio in Estoril, Portugal. James Bond Lifestyle‘s excellent research into this storied hotel describes that Ian Fleming himself had stayed there in May 1941, likely while shadowing rival spy Dusko Popov. Built in 1930, the Palácio Estoril continues to thrive to this day, offering “hotel, golf, and wellness” in an exclusive atmosphere that retains its classic pre-WWII elegance. George Lazenby may not have thought much of James Bond’s preference for traditional menswear, but he certainly looks the part in this well-tailored black tie kit that blends classic elegance with then-modern fashion. Goldfinger and Thunderball had established the on-screen relationship between James Bond and Aston Martin, placing the quintessential British secret agent in a quintessentially British sports car. 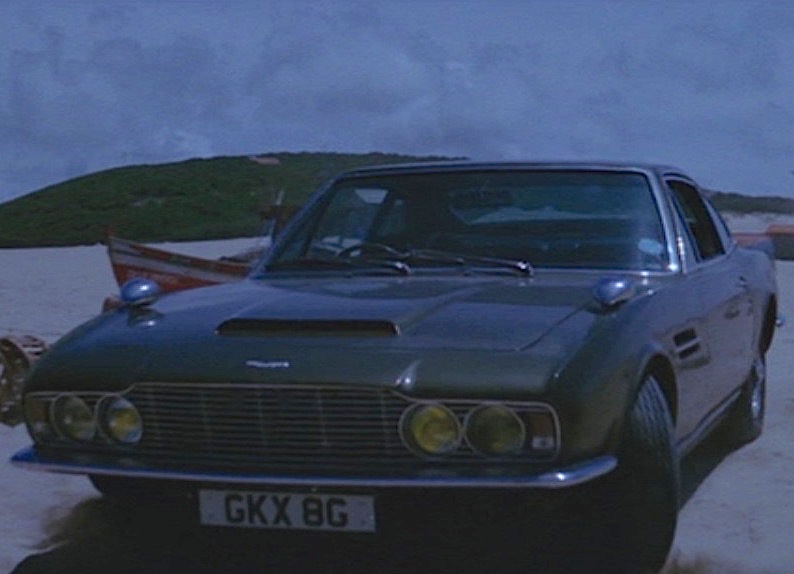 In its quest to establish continuity with the earlier films of the series, On Her Majesty’s Secret Service gives George Lazenby’s 007 his own Aston Martin, albeit an updated 1968 Aston Martin DBS Vantage. Bond parks his DBS at the top of the beach when observing Tracy’s erratic movements. Aston Martin introduced the DBS in 1967 as an intended replacement for the smaller DB6, itself a successor to the DB5 that had been popularized as 007’s gadget-laden sports car. The DBS incorporated a sleek, modernized look that was William Towns’ first design for Aston Martin. The base model of the DBS was powered by a naturally aspirated inline-six cylinder engine that produced 282 horsepower, though a Vantage performance option increased the output to 325 horsepower with Italian-made Weber carburetors. The DBS Vantage could reportedly reach a top speed of around 150 mph (241 km/h), a limit that Bond certainly would have been eager to test when racing Tracy. In 1969, Aston Martin introduced a V8 engine option for the DBS, and this 5340cc coupe was briefly the fastest four-seater production car in the world. The success of the V8 model signaled the end of the DBS, which ceased production after the 1972 model year, and the design was incorporated into the renamed “Aston Martin V8”. George Lazenby wasn’t the only James Bond actor to prominently drive an Aston Martin DBS. As debonair dandy Lord Brett Sinclair on The Persuaders!, Roger Moore had a “Bahama Yellow” six-cylinder, five-speed 1970 DBS that was re-badged and re-wheeled to resemble the V8 model. Sinclair was Moore’s final major role before he took over as James Bond in Live and Let Die in 1973. The first of James Bond’s armament that we see in On Her Majesty’s Secret Service isn’t his iconic Walther but rather a disassembled Armalite AR-7 rifle in the glove compartment of his Aston Martin. 007 fans would recall this being the “sniper rifle” issued to Bond by Q in From Russia With Love and used to great effect when eliminating Krilencu the Bulgar terrorist. In one of many instances of establishing continuity with the earlier films, the AR-7 appears here in Bond’s DBS. Bond even uses the rifle’s scope to observe Tracy before establishing that she’s in danger and heading into the ocean after her. When Bond’s trademark Walther PPK does finally show up, it’s not in his hands but those of Tracy di Vicenzo, who has removed it from his discarded holster and cornered him in his hotel room. Gunplay is evidently Tracy’s idea of foreplay. 007 disarms her with one swift movement of his arm, and the two find a more agreeable manner for getting acquainted. Curious to learn more about George Lazenby himself? The 2017 documentary Becoming Bond is certainly worth your time! Please stay alive… at least for tonight. George Lazenby and Diana Rigg on the casino set. George Lazenby and Diana Rigg evidently having a bit of fun on the casino set. The debonair George Lazenby on set. A real life James Bond? Production still of George Lazenby and Diana Rigg on the beach with a thug holding Bond at gunpoint. Is that pistol really silenced or am I just not able to hear you over those ruffles? Thanks as always for these fascinating details. I enjoy “On Her Majesty’s Secret Service” and in recent years have made a point of re-watching it around Christmas-time for some seasonable fun and colour. Very kind – thank you! Regarding those details… after seeing this film possibly a dozen times, I was tickled to finally notice the three Commander rings around 007’s cigarette and thought immediately of Fleming, though I haven’t been able to find any concrete evidence that Lazenby was lighting up a Morland & Co. cigarette.